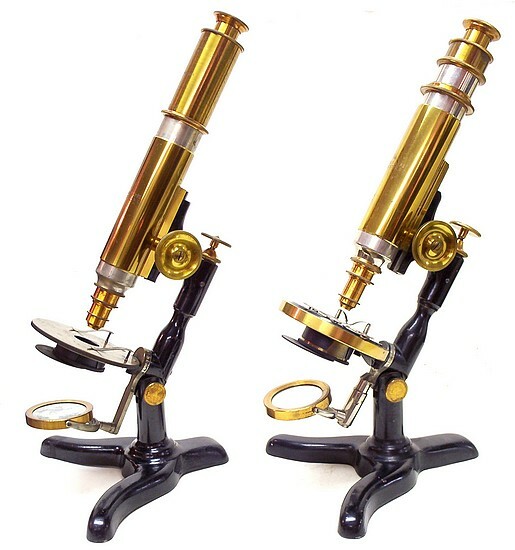 It is presumed that the example on the right is a later version of the Nonpareil microscope since it has a number of improvements among which are the addition of the drawtube, the focusing mirror mounting, an auxiliary glass stage with slide carrier, and a different casting for the base having an elongated rear leg which, presumably, results in improved stability when the instrument is inclined. 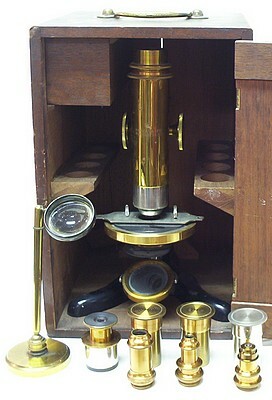 This instrument is designed to furnish a very complete microscope at a very low price. It is handsome and of good workmanship. The foot, pillar and arm are of iron, neatly japanned. The foot is a tripod of new design. The stand has a good rack and pinion, and micrometer screw adjustment. The latter is worked by a milled head on top of the pillar. The pillar has an Inclination joint which permits the body to come nearly to a horizontal position. The stage is of brass, circular, and it allows the greatest obliquity of light. It has removable spring clips, and, as a part of it, a sub-stage ring of standard size to receive accessories, fitting into which there is a revolving diaphragm. The ring is slotted for oblique illumination. The stage is so constructed that it may be removed, and a glass stage with slide carrier put on in Its place. The mirror-bar swings above the stage to any desired position, and it is graduated into five-degree spaces. It carries plane and concave mirrors, the latter being two Inches in diameter, and at the proper distance from the object in any position. The stand has a large tube, but its proportions are not displeasing. The sliding part of the body, the mirror-bar, and the mirror-arm are nickle-plated. The edge and under-side of the stage are dead black, while the upper surface is polished. The stand is thirteen inches or more in height, when arranged for use, and is equipped with a one inch eye-piece, a 2/3 and one inch objective, giving magnifylng powers of 99 and 154 diameters. 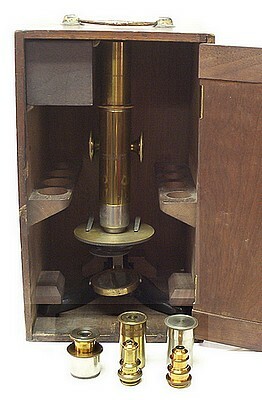 After the termination of his employment by Bausch & Lomb in 1878, Ernst Gundlach, for a brief period, worked with Philip Yawman and Gustav Erbe (also former employees of Bausch & Lomb) in the production of microscopes. It is clear that it was Gundlach who produced the optics, but it is less clear which firm actually manufactured the stands. Yawman & Erbe primarily were involved in the manufacture of office furniture and manufactured microscopes for only a very brief period in the early 1880's. 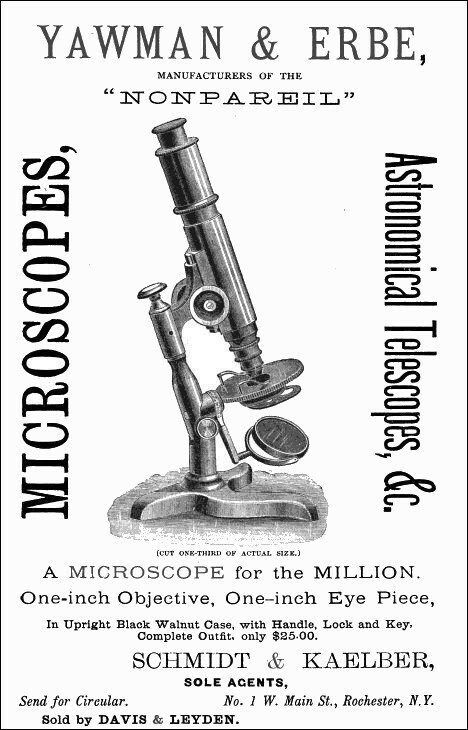 While the furniture produced by the firm is now rather common, the microscopes are far less so. The early history of the Yawman & Erbe firm has been documented. 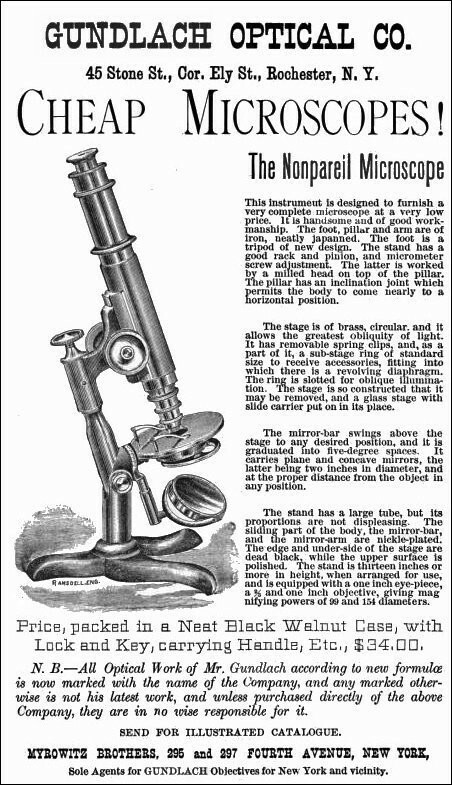 As indicated in the two separate advertisements shown above both firms sold the same model microscopes and as illustrated with the microscope shown on the left above, some instruments actually bear dual signatures. The storage cases for these two microscope are identical as are the storage cases for some other Gundlach and Yawman & Erbe microscopes in this collection ( look here and here ).